Metal rivets semi hard cover case featuring different prints that make your smartphone unique and stylish. 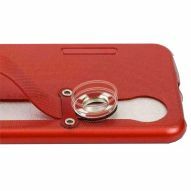 It perfectly fits your smartphone's shape while providing easy access to all phone functions without having to remove the case. The lightweight construction provides shock absorption plus impact and scratch protection.